The following features include information for all models within the Monster 821 Family and may not be applicable to all models. Please see your local dealer for further information. FRAME AND SUBFRAME: The new Monster 821 has a structure with a load-bearing engine and the main trellis frame attached to the twin-cylinder heads. The concept is derived from racing and was applied for the first time to a production bike with the Panigale project. This configuration allows for a very compact, lightweight frame, and, thanks to tubes with a large cross-section, also a high torsional rigidity, perfect for bringing out the dynamic qualities of the vehicle. The double-sided swinging arm of the Monster 821 also guarantees a compact 1480 mm wheelbase. The rear subframe seat support, also attached directly to the engine, has been redesigned, creating a compact structure intended to also support the new passenger footpeg brackets, separate from those of the rider, to provide greater freedom of movement during sport riding. The attachments for rider and passenger footpegs are made of cast aluminium and are fitted with aluminium footpegs. The rider footpegs are completed with an aluminium heel guard, underlining the sporty soul of the Monster 821. BREMBO BRAKING SYSTEM: The new Monster 821 braking system guarantees high performance and maximum safety in all conditions. On the front the Brembo radially-mounted, 4-piston, M4-32 monobloc brake callipers with axial master cylinder act on 2 semi-floating 320 mm discs, while the rear 2-piston Brembo calliper works on a 245 mm disc. The system comes standard with adjustable ABS Bosch 9.1MP. SUSPENSIONS: The new Monster 821 is equipped with a 43 mm diameter front fork and a rear monoshock with spring preload adjustment and hydraulic brake extension that utilises progressive linkage by fastening directly to the vertical cylinder on one side and the die-cast aluminium double-sided swinging arm. Thanks to a sustained but comfortable calibration of the suspensions and agile chassis dimensions, the Monster 821 ensures great speed during direction changes and a riding pleasure within everyone's reach. TYRES AND RIMS: The Monster 821 is equipped with 10-spoke light alloy rims measuring 3.5"" x 17"" on the front and 5.5"" x 17"" at the rear, mounting a Pirelli Diablo RossoTM III 120/70 tyre on the front and 180/55 on the rear. " The rear tyre is dual compound with high percentages of silica providing grip under all conditions, not only on dry surfaces but also on wet, and all of this results in truly sporty handling. The Pirelli Diablo RossoTM III tyres ensure superior, consistent performance over time because their technical characteristics are long lasting and make them enjoyable and fully usable throughout their life. COMPACT AND SPORTY: The nuovo Monster 821 was designed with the aim of creating a slim, simple and sporty motorcycle to highlight the original concept of "sport naked bike". Great attention was paid to the tank, still muscular but now lightweight and modern, and to the tail, compact and sharp in its lines, supported by a new steel trellis frame. MODERN AND CONTEMPORARY: "The front headlight of the nuovo Monster 821, contemporary and technological, recalls the circular shape that has always characterised the design of each Monster. " The new shape of the silencer recalls the higher displacement Monster and makes the whole back end of the bike sporty and modern. 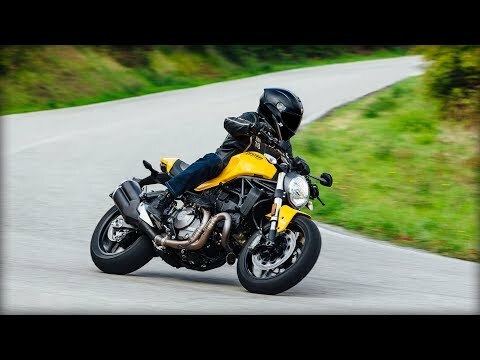 DUCATI YELLOW: The new Monster 821 shines bright yellow once again, a color that so many Monsteristas have fallen in love with in the past. The bike is also available in classic Ducati Red and matt black. TESTASTRETTA 11°: The nuovo Monster 821 is driven by the twin-cylinder Desmodromic Testastretta 11° with a displacement of 821 cm³, designed to be a structural element of the chassis. " "The engine ""breathes"" through Ride-by-Wire commanded throttle bodies, is Euro 4 approved (only for countries where Euro 4 standard applies) and ensures a maximum output of 109 hp (80 kW) with 9,250 rpm and a maximum torque of 8.8 kgm (86 Nm) at 7,750 rpm. Developed to ensure a delivery of full and progressive torque at every speed, this engine guarantees fun and usability that are within reach of all. Furthermore, long maintenance intervals calling for the control of valve clearance every 30,000 km make the Monster 821 a reliable and accessible bike. POWER AND TORQUE: With tailor-made and optimised exhaust and intake systems, the Testastretta 11° engine delivers a high power output of 109 hp (80 kW) without sacrificing an extremely favourable torque curve. Both the most demanding racers and urban riders will appreciate the vigorous torque, always available in a wide range of speeds, reaching 85% of its maximum value already at 5000 rpm. The character of the Testastretta 11° is exalted by the choice of the final ratio defined to develop the maximum acceleration and maximum engine response of each gear at every throttle opening. ANTI-HOP CLUTCH: The anti-hop wet clutch on the Monster 821 is cable-driven and requires little effort on the lever. Thanks to a progressive control system, the spring load is automatically increased. The result is a much greater sensitivity of the lever, which guarantees excellent comfort even in the event of frequent gear changes, in city traffic or on long journeys. When the torque on the wheel has an opposite effect, the same mechanism reduces the pressure on the clutch plates, allowing them to work in the anti-hop sport mode that counteracts the destabilisation of the rear end during aggressive downshifts while always ensuring safety and control. EXHAUST SYSTEM: The Testastretta 11° 821 engine is coupled with a type 2-1 exhaust system leaving no room for doubt about the performance it can deliver. The primary exhaust ducts, with a 50 mm cross-section, were designed with equal lengths to maximise engine power and efficiency of delivery. The system is equipped with a lambda sensor for each cylinder in order to autonomously and optimally manage the fuel supply. The silencers, combined in an overlapped and fully redesigned configuration, have a catalytic converter to ensure compliance with Euro 4 regulations, while the electronically controlled regulation valve optimises the exhaust pressure throughout the full range of use. Ducati Safety Pack: ABS Bosch, Ducati Traction Control (DTC). Riding Mode, Power Mode, LED position light and tail light, Display TFT colour display, Passenger seat cover, USB power socket. COLOUR TFT: The Monster 821 instrument panel features a colour TFT display with an indicator of the current gear and fuel level. The display, repositioned to ensure better daytime readability, provides a variety of viewing modes, each designed to show the information that is suited for different situations of use. All modes include the indicator with the current gear. HEADLIGHT: The front headlight of the Monster 821 is modern and contemporary, while recalling the circular shapes that have always characterised the front end of the Monster of each generation. It is also technologically advanced, using a halogen light source with ""horseshoe"" LED parking lights, a distinctive feature of all Ducati naked bikes. The rear light is also a LED. DUCATI QUICK SHIFT UP & DOWN (DQS): One of the accessories available for the Monster 821 is the Ducati Quick Shift up/down, an electronic system derived from racing that makes it possible to change gears without the use of the clutch and without closing the throttle when shifting up, and shifting down without using the clutch, but only with a closed throttle. The system consists of a bi-directional microswitch integrated into the gearchange lever linkage that, when used, sends a signal to the engine control unit. The system acts differently depending on the direction of the change, integrating advance ignition and injection during the upshift phase, and controlled throttle opening (automatic ""blipping"") when the gear pedal is pressed in downshift mode. The magnitude and duration of the solutions are implemented in such a way as to ensure maximum fluidity in various riding conditions. In acceleration, the DQS system saves fractions of a second that would otherwise be lost by closing the accelerator and acting on the clutch lever, and increases stability because the time in which there is no power output is reduced. When downshifting during braking, DQS allows the gears to be easily engaged without having to use the clutch, letting the rider concentrate exclusively on braking and cornering manoeuvres. This system not only makes sport riding more enjoyable, but also represents a valuable help in city traffic and winding roads that require frequent gear changes.